The US Army identified the soldier suspected of being involved in the massacre of 16 villagers in Afghanistan this week as Staff Sergeant Robert Bales, and said he arrived on Friday at a Kansas base where he will be held in a solitary cell. 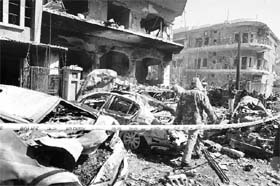 Twin blasts hit the heart of Damascus on Saturday, killing at least 27 people in an attack on security installations that state television blamed on “terrorists” seeking to oust President Bashar al-Assad. The founder and leader of WikiLeaks, Julian Assange, plans to run for a seat in Australia’s upper house of parliament, the anti-secrecy group announced on Twitter on Saturday. The comments could not be immediately confirmed. Al-Qaida chief Ayman al-Zawahiri has asked Pakistanis to revolt against their government and military by staging uprisings on lines of Arab Spring and labelled the nation’s army as “slaves of America”. Uganda’s government has taken to the Internet to correct a "false impression" about the country it says was created by a US celebrity-backed online campaign to hunt down fugitive warlord Joseph Kony. Yemeni security forces and unknown gunmen clashed today in the southern port city of Aden, wounding two policemen and a civilian, a security official said. "The Army confirms that Staff Sergeant Robert Bales was transferred to Fort Leavenworth, Kansas. Bales is being held in pre-trial confinement," the Army said in a statement. "I would assume he'll be charged pretty fast," said Jeffrey Lustick, a defence attorney and former Air Force military prosecutor and defense attorney in Bellingham, Washington. Bales is expected to face justice under U.S. military rules, but it is not clear where any trial would take place. Photos of a soldier identified as Bales, wearing camouflage and battle gear, appeared in an article about training for soldiers headed for Afghanistan on a web publication linked to Fort Irwin, a California military base. According to the website, the photos were taken in August. Bales' wife and two young children have been moved to Joint Base Lewis-McChord near Seattle for protection, said Bales' Seattle-based lawyer, John Henry Browne. The Army said Bales will be held in "special housing in his own cell" in the Fort Leavenworth detention center, which it described as a "medium/minimum custody facility." His military training included education in sniper skills, military leadership and a course called "combat life savers." The Baleses' off-white, spacious wood home sat dark on Friday night in a neighborhood now filled with news media in the town of Bonney Lake east of Tacoma. A children's playset was in the backyard, situated about a block from Lake Tapps. Few neighbours were present. At one house backing on to Bales' property, a handwritten sign addressed to media was posted on the door, reading: "We don't know Bales, so don't ask." Syrian television reported that cars packed with explosives had targeted an intelligence centre and a police headquarters premises at 7.30 am (0530 GMT), blowing the front off one building and sending debris and shattered glass flying through the streets. “We heard a huge explosion. At that moment, the doors in our house were blown out ... even though we were some distance from the blast,” one elderly man, with a bandage wrapped round his head, told a public television channel. No one claimed responsibility for the coordinated detonations, which echoed similar attacks that have struck Damascus and Syria’s second city Aleppo since December. “We have discovered that it is possible for Julian Assange to run for the Australian Senate while detained. Julian has decided to run,” WikiLeaks tweeted on Saturday. The earliest Senate election would not be until late 2013. The group also tweeted that it plans to field a candidate to run against Prime Minister Julia Gillard in her home seat of Lalor in Victoria. The Swedish warrant stems from Assange’s encounters in August 2010 with two women who were then WikiLeaks volunteers. They accuse him of sexual assault. He says they consented. “Tapping away at his computer in the study of the suburban compound in Abbottabad... Osama wrote memos urging his followers to continue to try to attack the US, suggesting, for instance, they mount assassination attempts against President Obama and Gen David Petraeus,” CNN’s National Security Analyst Peter Bergan wrote. 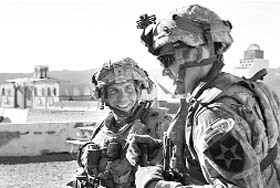 At that time, Petraeus was the commanding general of NATO forces in Afghanistan. Believed to be in deep hiding, Zawahiri surfaced for the first time in months to post a ten-minute video uploaded to jihadist forums, saying the Pakistan army was in “partnership with America” in a war against Islam. “Cannot a million free people rise from amongst the Muslims of Pakistan to stage a protest against the Generals of Pakistan Army so as to force them to stop their treachery?” Zawahiri, 60, said in the video. Uganda, making efforts to find the suspected war criminial whose global profile soared after a YouTube video went viral, wants to show the world Kony is not in the country and it is doing all it can to find him. The video uploaded on YouTube made by California-based filmmaker Jason Russell has been viewed by tens of millions of people, promoted on Twitter with tags that include #Kony2012 and endorsed by the likes of Justin Bieber, George Clooney and Oprah Winfrey. Russell’s video racked up nearly 80 million hits on YouTube and rased global awareness.